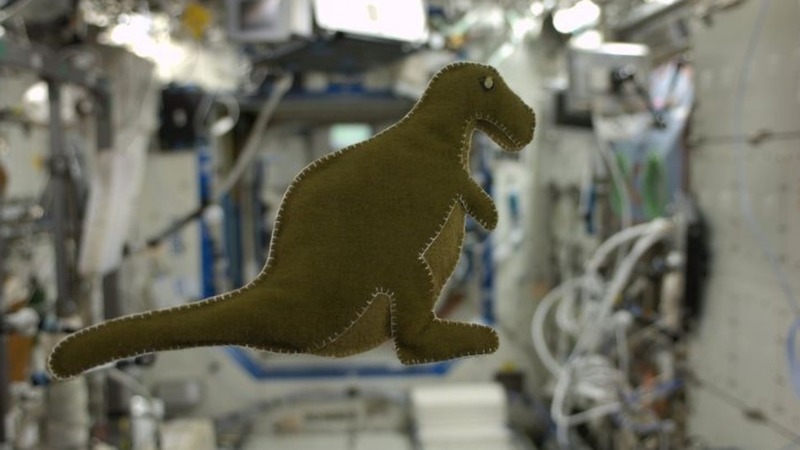 Credit: This is a NASA photo, of the stuffed dinosaur Karen Nyberg sewed on the International Space Station. This little T-Rex is floating weightless now, but by mid-November when the crew returns, will be a present for Nyberg’s 3-year old son. There’s more on this here. I said on Facebook that this was cooler than Alan Shepherd’s golf shot on the moon. That was certainly neat, but it was a one-off – almost performance art. This is tangible, and more meaningful on so many levels. First, this little toy, made by a parent far away from children presents an immediate and personal connection to far-flung families working through voluntary or enforced separation. As a product of a traditional female craft floating in a world of shiny engineering, it makes a statement to millions of women and girls, who are often told that they have to choose between hard science or the softer pursuits. It’s not an either/or world out there. You CAN be an astronaut and sew for fun. It’s entertainment – doing the familiar in an unfamiliar environment for stress abatement. That’s something I can certainly identify with, having taken a mini-stash of stitching and knitting supplies with me here to India. It’s creativity and the boundless urge to make something out of what little is at hand. The ingenuity of making a toy from the unlikeliest of scrounged discards is admirable. It’s whimsical, and adorable (and very nicely stitched). It speaks of a charming sense of humor, and of a very happy little boy. And for all I know, it may be a sly nod to the Dr. Who episode “Dinosaurs on a Spaceship”. It’s a tangible that will come home with Flight Engineer Nyberg, and (as long as it lasts) be a reminder of where she was able to go. It’s an heirloom of her house now, a priceless and totally unique souvenir of her achievements. Finally Mr. Saurus is a statement that space is a new normal – a place where people will increasingly commute to work, and come home again. “I’m from Iowa, I only work in space” – brought to life off the movie screen. So thank you Ms. Nyberg! You’ve made my day! So Facebook search is now so screwed up I could not find you or F. there. Aaaaaiiii. Good to see you! I’m always here. There, too – kbsalazar. (Links to F’s blog page in my sidebar at right). Friend request duly sent. Amused that someone on your friends list and I have 7 mutual FB friends from wildly different parts of my life (martial arts, the Well, science fiction fandom, and someone I’ve known for about a year who has been two degrees of separation from me in multiple directions for the last 20 years).